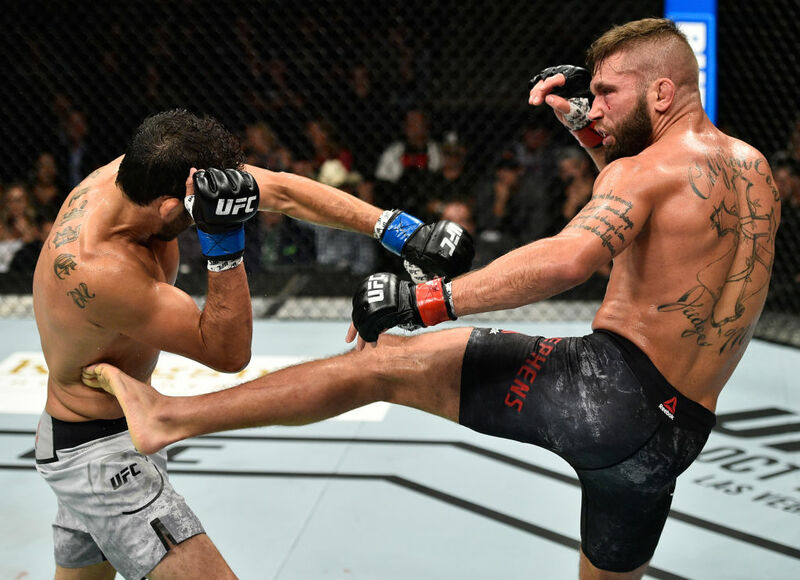 Saturday’s UFC 215 event is in the books, and now that the dust has settled in Edmonton, it’s time to go to the scorecard to see who the big winners were at Rogers Place. While the scrambling of the UFC 215 Pay-Per-View card after the main event between Demetrious Johnson and Ray Borg was scrapped rattled some, others viewed it as an opportunity, and as the co-headliner Rafael Dos Anjos stepped up in a big way with a first-round submission win over Neil Magny that dropped jaws around the MMA world. It wasn’t that Dos Anjos won, but how he beat his fellow contender in his second welterweight bout in the Octagon that impressed. If the former lightweight champion keeps this up, he may end up being remembered for what he does at 170 pounds than what he did as a titleholder at 155 pounds. Moved from the prelim portion of UFC 215 to the PPV main card, Henry Cejudo took advantage of the added spotlight as well, as he delivered a blistering second-round TKO of fellow flyweight standout Wilson Reis. In the time since his loss to Johnson in 2016, Cejudo has elevated his striking game immensely, first in a razor-thin loss to Joseph Benavidez last December, and now against Reis. Cejudo is one of the rare flyweights who looks like he can challenge Johnson a second time and have more success than he did in their first bout, and while he won’t likely get a rematch with “Mighty Mouse” next, a rescheduling of the canceled bout between Cejudo and Sergio Pettis would be a nice way to determine who will get a 2018 shot at the title. No, Amanda Nunes didn’t deliver a decisive finish against Valentina Shevchenko on Saturday night like she did against Ronda Rousey or Miesha Tate. And no matter who the fans believe won or lost the pair’s rematch, the point is that “The Lioness” left the Octagon with the belt after showing a few more dangerous tools to her arsenal, and that’s why she earned a spot here. Before the fight, Nunes was seen as a frontrunner who would fall apart down the stretch, and one whose attack was focused on aggression and blitzes and nothing else. But Saturday, she showed the cardio to go five rounds, the ability to stick to a tactical game plan, and to have the gas in the tank to make a late surge that probably earned her the nod on the scorecards. Now she becomes a more difficult puzzle to solve, but who will get the next shot to solve it? Holly Holm? Raquel Pennington? Julianna Pena? Shevchenko? Call me crazy, but I’d love to see Cat Zingano return, get a win, and then engage in a rematch with Nunes. I’m guessing that one won’t go five rounds, but what a ride it will be in the meantime. Okay, I’m cheating a little bit by making a three-way tie for fifth place, but I think the three gentlemen here all deserve a spot. And I could have gone even longer, because I definitely want to throw a shout out to Gilbert Melendez for his gritty effort against Stephens and to Mitch Clarke for a career well fought. But anyway, props to the veteran Stephens for not just winning big against Melendez, but for fighting a disciplined fight for 15 minutes. Melendez needed this one to turn into a close quarters brawl for him to win after his leg got chewed up by Stephens’ kicks, but “Lil’ Heathen” fought smart and controlled the pace and distance en route to a huge victory. And he gets a new bride in a couple weeks. Well done, Mr. Stephens. When I spoke to Rick Glenn before his fight against Gavin Tucker, there must have been at least three references to how much he loved his new home in California. And that was a good thing to hear, because Glenn is one of those guys who came up the hard way and wasn’t handed anything on his way to the UFC. So to hear him that happy let me know that a career-defining performance might be coming, and on Saturday, the newest member of the Team Alpha Male squad delivered just that when he scored a punishing win over Tucker, proving that a change of scenery, experience and the ability to fight full-time can mean everything in this game. Not every one of the 1.324 billion people in India will become MMA fans after the successful UFC debut of Arjan Bhullar. But you have to think a sizeable portion of the population will at least pay attention to the exploits of the 2012 Canadian Olympian, who has the skill, back story and charisma to make an impact that could shake up the sport in the future. Now I’m not saying he’s going to become a heavyweight Conor McGregor, but when a country has one of their own competing and succeeding at the highest level of the sport, it makes fans and it also opens the door for other athletes from that nation to get opportunities they may not have had before. That’s a lot of pressure on Bhullar, but it’s also something he embraces. Keep your eye on this heavyweight prospect.